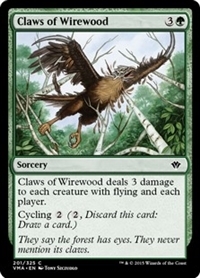 Claws of Wirewood deals 3 damage to each creature with flying and each player. 10/1/2008 Cycling is an activated ability. Effects that interact with activated abilities (such as Stifle or Rings of Brighthearth) will interact with cycling. Effects that interact with spells (such as Remove Soul or Faerie Tauntings) will not.